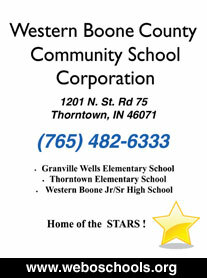 The Western Boone County Community School Corporation (WBCCSC) enrolls approximately 1,931 students in Thorntown Elementary School, Granville Wells Elementary School, and Western Boone Jr./Sr. High School. The corporation currently employs 206 dedicated faculty and staff, many of whom live within the boundaries of the district. As a result of these educational mentors’ central location, “their knowledge of, service for and leadership within the local communities creates a meaningful relationship between our schools and faculty,” relates Susan Ottinger, Director of Curriculum. Additionally, 86 percent of WBCCSC’s staff is involved in extracurricular activity sponsorship and coaching. WBCCSC has implemented a wealth of curricular courses and activities designed to enhance learning opportunities for its student base. Western Boone High School is equipped with a strong Vocational Educational program, as well as Project Lead the Way, a program created for those interested in pursuing careers in the fields of science, engineering and engineering technology. At the primary level, both elementary school facilities offer full-day kindergarten classes and extended-day preschool programs. Lebanon Community School Corporation (LCSC) serves approximately 3,550 students from Lebanon, Worth and Perry townships within six facilities—Central Elementary School, Harney Elementary School, Hattie B. Stokes Elementary School, Perry-Worth Elementary School, Lebanon Middle School and Lebanon High School. The corporation is fortunate to encompass 254 certified educators who provide services to students in the general classroom, a number of specialty areas—such as the fine arts, vocational education, agricultural education and health education, to name a few—and a variety of extracurricular activities. The Lebanon Community School Corporation is one of only 25 schools out of 294 school coporations in the State of Indiana that has earned the designation of “Exemplary School Corporation for 2008,” according to Dr. Tony Bennett, State Superintendent of Schools. According to Dr. Robert Taylor, Superintendent of Schools at LCSC, over the last decade or so, the district has progressed in the execution of several key curricular programs that address the learning needs and preparation of its student body. LCSC has incorporated the full-day kindergarten program at all elementary schools and has placed a focus on refining its balanced literacy programming at the elementary level. The high school has seen an expansion of the honors and Advanced Placement (AP) courses, combined with a major increase in opportunities for vocational education. This commitment to ensuring student success and preparation for both the work force and post-secondary education has led to much acclaim over the years. Individual student and staff recognitions are awarded on a regular basis. Likewise, respective schools and the corporation as a whole have also been recognized for academic achievement and professional presentation. Lebanon High School has received the Indiana Chamber of Commerce’s “Best Buy” award, and Lebanon Middle School is recognized as a leader in Central Indiana in the area of student services with the Advancement Via Individual Determination (AVID) Award. Among some of ZCS’s distinguished programs are its robust AP course offerings, which have boasted results that are recognized at state and national levels; a new International Baccalaureate (IB) course; nationally and international ranked teams, clubs and student publications; successful intramural, inter-scholastic and club sports teams; and dedicated Parent Teacher Organizations. All of ZCS’s schools—Eagle Elementary School, Pleasant View Elementary School, Stonegate Elementary School, Union Elementary School, Zionsville Middle School (ZMS), Zionsville West Middle School and Zionsville Community High School (ZCHS)—are designated Four-Star Schools by the Indiana Department of Education. On top of this prestigious recognition, ZCHS has been named the Indiana State Chamber of Commerce’s “Best Buy” each year since 1999, while also being ranked among the top 500 high schools in the country by U.S. News & World Report in December 2007. Plus, both ZMS and ZCHS have been awarded the National Blue Ribbon School Award from the U.S. Department of Education in recent years. TPCA’s presence in the area began more than 30 years ago with the opening of its nursery school. Today, the school enrolls approximately 550 students, as of the 2008-2009 school year. In the late 1980s, the school adopted a mission to grow one grade at a time. Students began attending kindergarten in 1990 and middle school by 1999. TPCA recently opened its college preparatory high school in August 2008 with grade nine and is welcoming students to enroll in grades nine and 10 for the 2009-2010 school year. By fall 2011, TPCA will provide a Biblically integrated, rigorous curriculum to students through grade 12. To accommodate its growth, the school relocated to newly constructed, award-winning facilities in spring 2007. Additionally, plans are in development to add further classrooms and office space to the secondary school wing of its current facilities. Graduating seniors and adults in Boone County looking to continue their education have a choice among numerous colleges and universities located within a short distance from home. The county sits midway between leading institutions such as Purdue University, Indiana University and Ball State University, and its locality just outside of Indianapolis provides it with an even bigger selection. Indianapolis offers many excellent opportunities for higher learning through a number of established colleges and universities. The city alone is home to such campuses as the University of Indianapolis, Butler University, Ivy Tech Community College, the Indiana University-Purdue University Indianapolis campus, Marian College, the Indiana Institute of Technology and Indiana Business College. A partnership between Purdue University, Boone County government and the Community Foundation of Boone County led to the organization of the Boone County Learning Network (BCLN) in 2006. This nonprofit educational resource exists to provide affordable and easily accessible educational programs and services to lifelong learners, college students, businesses and organizations in Boone County. “In today’s economic climate, more than ever, citizens are in need of updating or learning new skills, discovering a new hobby, or charting a new career path,” explains Audra Poe, Executive Director. BCLN offers flexible options for those in search of personal or professional enrichment, as well as college courses and degree programs—all of which are available at several locations throughout the county. In addition to these great opportunities, BCLN partners with local and Central Indiana organizations to offer work force development and job training programs, along with economic development education. “We are working to expand our work force development and job training programs, as well as bringing more college and university classes to Boone County,” says Poe.